The 2009 Swartkop Air Show, organized by the South African Air Force Museum, took place on the 12th of September at Air Force Base Swartkop outside Pretoria. This was the first air show in four years held at this historic location, which was the first airfield used by the South African Air Force (SAAF) and has been in operation since 1921. AFB Swartkop is also home to the South African Air Force Museum, which houses most of its extensive collection of historic aircraft there. The museum has accumulated an impressive collection of over 150 complete aircraft and displays many of then in various hangars and as open-air static displays. Part of the museum's task is to keep flying examples of various aircraft types that once served in the South African Air Force. 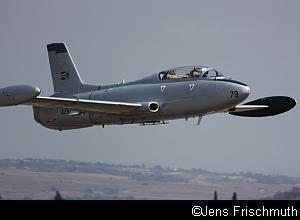 Besides flying the museum's historic aircraft, the South African Air Force flew many of its current planes in service. Thus, the spectators at the airshow saw an amazing variety of military aircraft on display. 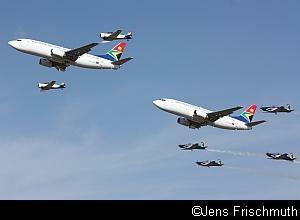 Various ex-SAAF jets flew on the day. The De-Havilland Vampire T.55, South Africa's first jet fighter, made a welcome return to the skies in the capable hands of Lt. Col. Glen Warden. A total of 77 Vampires were operated by the SAAF from 1950 until they were phased out and replaced by the Atlas Impala by 1972. They served with distinction in the Air Force, mainly as trainers. Their role as front-line fighter did, however, not last long as Canadair Sabres took over that role from 1956. An Atlas MB326M Impala MkI was displayed by Mike Weingartz, who is currently a Senior Maintenance Pilot at Denel Aviation. Mike served in the Air Force for over 22 years and holds the distinction of being the only pilot who has accumulated more than 5000 flying hours on the Impala. The Impala served as a light ground attack aircraft and operational jet trainer in the SAAF from 1966. 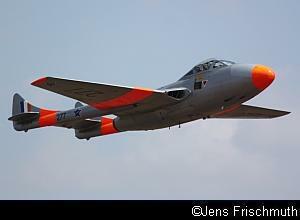 Based on the Aermacchi MB326, it was built in South Africa under license at Atlas Aircraft Corporation. A total of 151 MkI (dual seat trainers) and 100 MkII Impala (single seaters) were built and remained in service until they were withdrawn in 1995 to make way for the BAE Hawk. 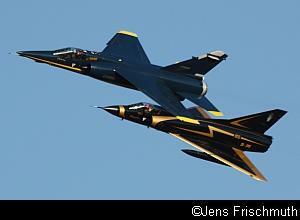 A highlight of the airshow was a dual display flown late during the day with two of the museum's Mirages. The two jets flew a few passes together before doing individual displays which included touch-and-gos by both planes. Both planes had also performed individual displays earlier during the day. The Mirage IIICZ was flown by Lt. Col. Glen Warden. A total of 58 Mirage IIIs were operated by the SAAF from 1963. The Mirage III served as an interceptor fighter, ground attack aircraft and reconnaissance plane. From 1986, a total of 25 Mirage IIIs were converted to Cheetah Ds and Es as part of the modernisation of the Air Force and the Mirage III was last flown operationally in 1990. The Mirage F1AZ displays were flown by "Blokkies" Joubert. The F1 was used by the SAAF in the air interception and ground attack fighter role from 1975 until 1997 and was used to great effect in operations in Angola in the 1980s. The SAAF Museum's North American AT-6 Harvard, in its original silver and day-glo trainer colours, flew a solo display and further Harvard action was provided by the 4-ship Flying Lions display team, who flew a display routine during the day and then ended the airshow with their famous night show. More than 700 Harvards served in air schools in South Africa during the Second World War to train pilots and a large number remained in South Africa after the war. 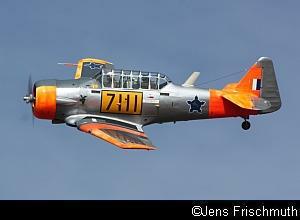 The South African Harvards were only withdrawn from service in 1995, when they were replaced by the Pilatus PC-7 Astras as ab-initio trainers. Another museum aircraft displayed was the Douglas C-47 Dakota. Dakotas upgraded with turbo-prop engines still serve with 35 Squadron in the maritime patrol role. 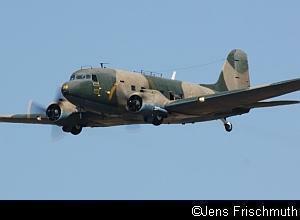 The C-47 is by far the oldest military aircraft type still on active duty. Also flown was the Atlas AM3C Bosbok, a light aircraft that performed forward air control duties and the Atlas C-4M Kudu, a similar aircraft based on the Aermacchi AL60 and used as a general purpose light transport plane. The Museum flew three of its helicopters, the Sud Aviation SE3130 Alouette II, the Alouette III and the Aerospatiale SA330 Puma. The three helicopters performed a formation display and then did individual performances. The Alouette II was in service from 1960 until 1973 and was used extensively to train pilots before they progressed to the bigger Alouette III. The Alouette III, the first turbine-engined helicopter to attain large-scale production, served with distinction in the SAAF from 1962 until 2006. The Puma, a medium-sized, general purpose all weather helicopter, was in service from 1970 until 1998. The participation of the Air Force added greatly to the day's entertainment. The Swartkop Airshow is one of only two airshows that are supported by the South African Air Force this year, as the Air Force is currently focusing its resources on supporting events like the Confederations Cup that took place in South Africa earlier this year and the Soccer World Cup due to take place in South Africa in 2010. 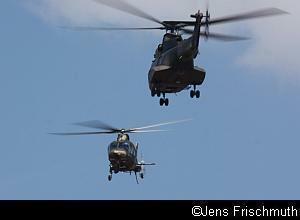 The SAAF had four Agusta 109 Light Utility Helicopters and two Oryx helicopters at the air show. An Agusta flew an interesting dual display with an Oryx. Some of the helicopters also participated in the opening parade and took part in fly-pasts at a Wings Parade held on the Friday morning, where 21 pilots, 2 navigators and 1 flight engineer received their wings. The Agusta 109 LUH, a multi-role twin-engine helicopter, has been in service with the SAAF since 2003. The Atlas Oryx was developed by the SAAF and is similar to the AS332 Super Puma. It has been operational since 1990. 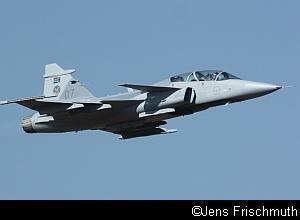 The South African Air Force also flew its latest fighter, the SAAB JAS-39 Gripen. This was the first time that spectators in the Gauteng province could see a South African Gripen flown by a South African pilot at an airshow. The Air Force brought along two Gripens, one as the display plane and another one was on static display. The SAAF recently received the last of the nine two-seat Gripen Ds it ordered and is awaiting delivery of a further 17 single seat variants. The first Gripen D was accepted by the South African Air Force in April 2008. 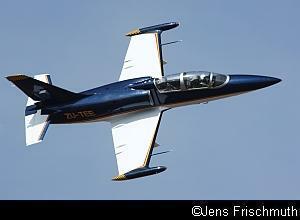 More fast jet action was provided by the BAE Systems Hawk Mk120, the lead-in flight trainer for the Gripen fighter. The South African Hawks have their cockpit avionics and tactical systems configured so that they closely resemble those of the Gripen. 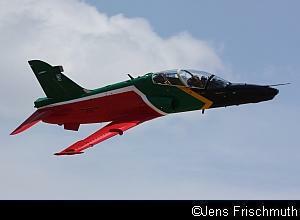 A Hawk painted in the colours of the South African flag was used as the display aircraft and a second one in the standard grey colours could be seen on static display. Other SAAF displays were undertaken by a CASA CN 235 medium transport plane, a Hawker 50 from 21 squadron normally used as a transport plane by the State President and members of parliament and a Cessna 208 Caravan, a general utility aircraft capable of carrying 12 passengers. 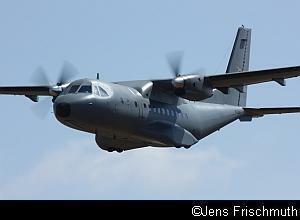 The CASA 235 was also used as the transport plane for the skydiving displays. First seen at the Durban Airshow and now repeated at Swartkop was the amazing formation flown with two South African Airways Boeing 737-300s, the five Pilatus PC-7 Astras of the Silver Falcons and two North American AT-6 Harvards. All the aircraft involved in the fly-past took off from AFB Swartkop before the display and the spectators could see the formation forming up. The slower Harvards formatted on the wingtips of the 737s last and broke away from the formation after a single pass over the airfield. As soon as the Harvards dropped off, Scully Levin in the lead Boeing 737 asked the formation to increase their airspeed by 150 knots. The 737s flew a few more circuits with the Silver Falcons, after which the Falcons broke away from the formation too and left the two 737s to perform their own display which included a touch-and-go by both planes. The Silver Falcons performed their display routine immediately afterwards. The Silver Falcons also performed another two superb displays during the day. One of them was their flat routine which features different maneuvers and formations from their normal routine. Civilian participation at the airshow included a formation display of a North American AT-6 Harvard and the two Extra 300s of the North West Eagles, a display by a Tiger Moth and the high impact show flown by the Goodyear Eagles in their Pitts Specials. Pierre Gouws flew a solo display in the Aero L-39 jet and also flew a dual display in the L-39 with the Impala MkI of Mike Weingartz late in the day. Towards the end of the airshow, the Chief of the Air Force, Lt. Gen. Carlo Gagiano, addressed the crowd and commented on the outstanding success of the airshow. He noted that Air Force Base Swartkop was the ideal location to stage a major military airshow as the public interest generated would complement the outstanding work done by the Air Force Museum. As the biggest aviation event in South Africa, the Africa Aerospace & Defence Expo, is currently staged in Cape Town every two years, he promised the residents of Johannesburg and Pretoria that Air Force Base Swartkop would host major airshows in future. This fitting tribute summed up a highly successful event. The photo galleries below include pictures from the build-up to the airshow. Also, a special section features the Mirage IIICZ and Mirage F1AZ, which were based at Lanseria International Airport for the duration of the airshow. Omer Mees photographed the jets at Lanseria and we thank Omer for sharing his pictures with us.